Two days ago on 6.10.2017, I watched a very good movie, Blade Runner. The 6th of October is a very important date in the movie, and half-way through the movie, I realised I was watching a movie that focused on that particular date, on the same date! Yesterday was the 7th of October and the 7th day of each month is an important day to me too. We all attach meanings and importance to dates. Maybe some more than others. And last Saturday, on the 7th of October 2017 or as I like to put it 7.10.17, I finally decided to blog about my little Prince. I thought I could conceal his presence longer, just being selfish, embracing our private moments and enjoying my time with him without sharing about him either on my blog or my IG. Protecting him from social media, in a way. I know, I already shared some of his pictures on IG, but I've never written about him on my blog. I make no apologies for doing so. I didn't know if it was possible to indefinitely keep him off social media especially as I'm a blogger and avid Instagrammer and someone who really loves to capture, record moments and loves sharing, but I felt it was worth it to try. But after around 300 beautiful days of having him all to myself (yes, it's almost been a year already), I decided I couldnt keep him hidden any longer. I had the urge to share this because my heart has been bursting with extreme happiness and filled with so much joy and I want the future me to read this and remember how blessed and grateful I am at this moment to have my son in my life. The gift, the blessing, the light to my darkness, the brightest colour of my life at the moment, my prince, my third child, my first living child, my pride and joy, my happiness, my miracle, my little E, ELHAN. In Arabic, Elhan has two meanings, depending on how you pronounce the H. Elhan means "to eloquently state something", "to have a beautiful voice" or to recite the Qur'an in a melodic and beautiful way. The root word of Lahina is "to be intelligent" or "to chant in a melodic way". The other meaning is "a gift after a long journey". Deep and very apt. My favourite. I just love both meanings so much. Elhan also means "prince" or "emperor" in Turkish. My little E is truly a gift after what seems like a lifetime. After such a long personal journey that I have been through, I have been blessed with his presence and laugh and love. Elhan, I have loved you even before you were born. When I held you for the first time my heart was so full of love, joy, happiness and indescribable feeling of love. Oh, those adorable little fingers. God is Great! 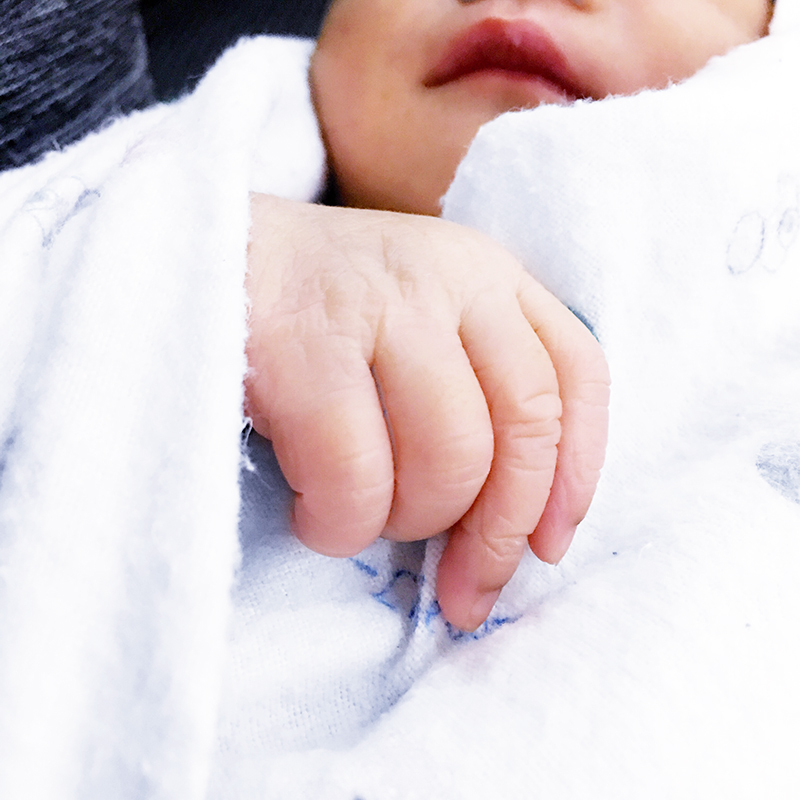 I took this photo on the day Elhan was born last year while his Abah was holding him. I can still remember when I saw your adorable face, hands and feet on the day you were born. You stole my heart from everything else. Watching you open your eyes and experiencing every single movement for the first time, I feel so blessed. Watching you sleep is one of the most beautiful feelings ever. When I first see you smile, indescribable. I have been a mother for around 5 years already but end of last year this is the first time I became a mother to my first child who is still alive. Elhan's elder siblings exist somewhere wonderful but not in this world. It is also the first time I get to breastfeed or nurse my child which was an amazing miracle though it took a lot of effort at that time. It stopped when I had to travel for work for about 10 days. The first few months of being a mother to a child here on earth even though exciting, it was also exhausting, that I cannot lie. But its the good kind of exhaustion. The kind that is definitely worth it. The positive kind. 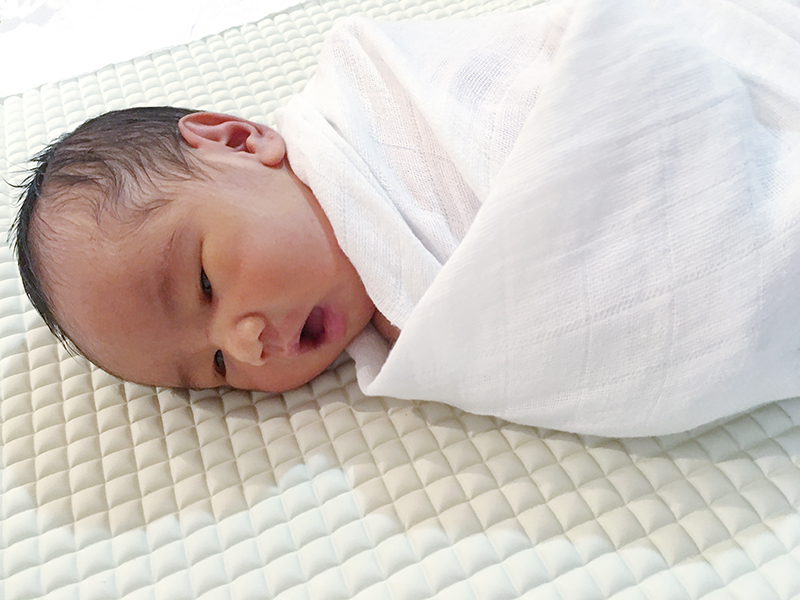 Elhan is such a good baby, a good son, a cheerful, sociable little boy. He is easily amused by my silly faces and sometimes even when I'm not making any silly faces, he laughs as though I'm making funny faces. He's easily entertained by others too and sometimes even strangers that we sometimes meet in the lift or while queuing up somewhere. (Guess he is in one of those friendlier phases :D) It's one of the best feelings in the world so see my son smiling and laughing! It's as though I want to freeze that moment forever. It feels like it is the purest form of love. Took this photo on the 3rd day after he was born. Just before his morning bath. I am truly blessed to have Elhan in my life. Lucky to have him as my son. Grateful to our Creator for bringing him into my life. Coloring my life, changing my life in a positive way, bringing joy and lots of love. Mama loves you so much Elhan. Even more than anything else in this world. Definitely more than myself. I would bleed myself dry for you if I have to. And in fact, I did. Every tear, every blood dropped, every pain felt, it was all worth it. Thank you for being here in my life my dearest Elhan. May you always be protected, protected from any sickness, danger or harm, protected from negativity, protected from all things which are bad or evil. May you always be blessed and surrounded with love, joy, positivity and contentment always. May you be stronger by the day, smart, intelligent and happy. May you continue to be a good boy always, obedient, grow up to be a kind man, a successful person in this life and the Hereafter. My Little E was born on the 7th and each month, as a reminder of the gratitude that he came into our lives on that day (and the 7th being my favourite number as well) I am thankful and grateful and celebrate it every month. 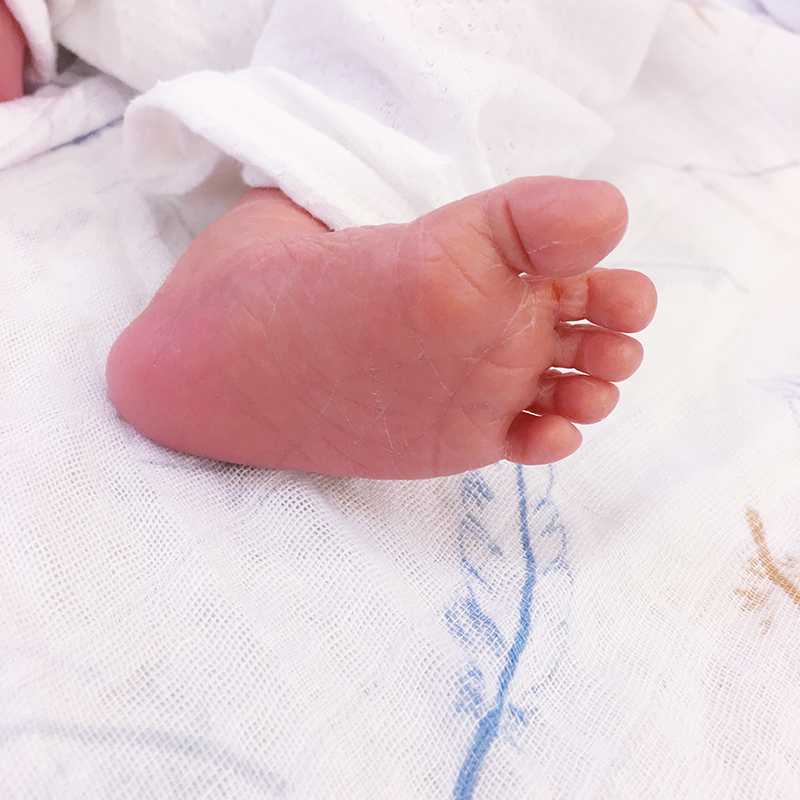 A photo of his cute and adorable feet just 3 days after he was born. So so much love! Congrats! Semoga Elhan menjadi anak yg soleh. Penyejuk mata mama & abah. Berjaya dunia & akhirat. Amin. About your son being friendly, that's so true! During CemaraWunggu monologue at your dad's gallery I couldnt focus anymore after he said hi. So adorable! Congratulations Breen.